The history of our family business is worth sharing. We are proud of where we’ve been and what we’ve become. The best value in natural products. 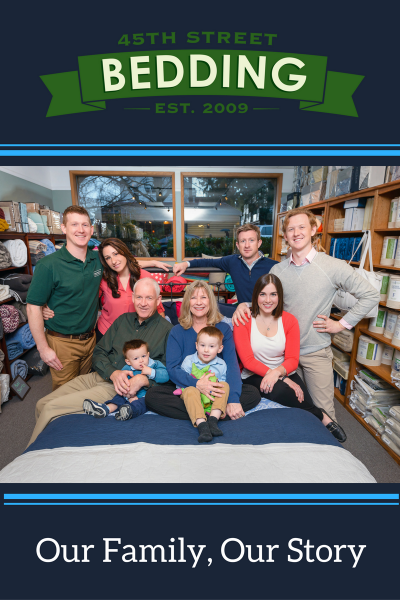 45th Street Bedding is a family-run business committed to bringing quality products to our customers. We’ve been in the mattress retail business since 1972, so we know a thing or two about this industry and how it’s generally run. As the years progressed, we tailored our inventory to further meet the needs of our customers, incorporating a more diverse range of products, including bedding. At first, we operated as a vendor for larger mattresses and bedding companies; however, when standards began to slip, we knew it was time for a change. So in 2009, 45th Street Bedding was born. The 2008 recession hit businesses hard. To save money, many of our suppliers cut corners in the production process. This created an ethical dilemma for our own business. It didn’t make sense to us to sell inferior products at the same price point as before. This kind of behavior isn’t fair to customers. The natural solution to this problem was to start developing our own product line, bypassing the middle man. Alone, we can insure products meet our exact specifications. Materials are of the utmost quality. Prices become more competitive because we were no longer dependent upon suppliers. If you’re at all acquainted with the 45th Street Bedding line, you know we love wool products, and for good reason! Wool is an excellent bedding ingredient: It’s naturally moisture wicking, which means it keeps you cool, comfortable, and dry throughout the night. No sticking your leg out from under the covers in a feeble attempt for temperature control. In fact, we love wool so much that our first products in the 45th Street line were the Minnesota Wool Topper and the Minnesota Wool Comforter. Happy with our wool endeavors, it became time to tackle mattresses. In 2012 we received our first shipment of botanical latex mattresses from our producing and manufacturing plant in Vietnam. One year later, we officially trademarked the modified Dunlop Process we use to create these durable, comfortable, environmentally friendly products. We call this process Botanicore™. Of course, we only use natural rubber harvested from rubber trees in this process. No synthetic foam. Not now, not ever. So, how does our production process differ, you may ask? The normal Dunlop Process involves pumping latex into a closed mold. This mold is kept horizontal, and heated to an internal temperature of 173 degrees, solidifying the latex. The finished product is durable. However, using a closed mold means that it is possible for air to become trapped in the latex foam. When this happens, you run the risk of losing uniformity of support and feel in the mattress. Baking the latex horizontally is another problem. The latex tends to settle more heavily at the bottom of the mold. The result is a dense bottom layer, and a softer, lighter top layer. Once again, uniformity of support and feel is disrupted. Our modified version of the Dunlop Process is done with an open pour mold. The latex foam is poured into the mold and raked, insuring no air pockets remain. The mold is turned on its side before baking. Keeping the mold vertical insures a much more uniform consistency throughout the entire mattress, which means you’ll sleep more comfortably! As the years progress, we continue to grow our line of products to meet the needs of our customers. Most recently, we added the Australian Wool Topper and the Full Mattress Encasement. Additional products are being tested as we speak! We’d like to tell you more, but you’ll just have to stay tuned for further updates. We can’t give away too much!